After the signing in 1783 of the Treaty of Paris, in which Great Britain recognized the independence of the United States, the two countries were again drawn into conflict over tensions between Britain and France. In 1806, during Thomas Jefferson's administration, France prohibited all neutral trade, including that from the U.S., with Great Britain; in the next year Britain responded by embargoing trade between France, her allies, and the Americas. The U.S. then enacted its own embargo prohibiting U.S. vessels from trading with European nations, followed by further legislation directed solely at France and Britain. President Jefferson's Secretary of State, James Madison, protested to France and Britain that their acts interfering with American shipping were contrary to international law, but his complaints were curtly dismissed; in the words of Federalist Congressman John Randolph of Virginia, Madison's words had the effect of "a shilling pamphlet hurled against eight hundred ships of war." 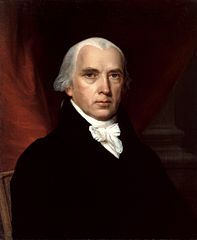 James Madison had served as Secretary of State under President Thomas Jefferson during the period when the war between Great Britain and France had interfered with American trade and shipping. Madison had protested to Britain and France that their actions were contrary to international law, but his complaints were curtly dismissed; in the words of Federalist Congressman John Randolph of Virginia, Madison's words had the effect of "a shilling pamphlet hurled against eight hundred ships of war." In an attempt to bring pressure for an end to the harassment, When the embargo sparked opposition and led to an economic recession in the U.S., the Embargo Act was repealed, shortly before Madison was inaugurated in 1808 as Jefferson's successor after having easily defeated Charles Cotesworth Pinckney, the Federalist candidate who also had run against Jefferson four years earlier. Despite further diplomatic efforts to resolve the situation, the British continued to stop American merchant ships to search for Royal Navy deserters; to impress American seamen on the high seas into the Royal Navy; and to enforce its blockade of neutral commerce. After taking office, Madison made the issue of impressment of American sailors by the British into their own Navy a matter of national sovereignty—even after the British agreed to end the practice. Under increasing pressure, Madison sent a message to the Congress listing the reasons justifying war, and asked it to consider an appropriate response--without expressly asking it to declare war. 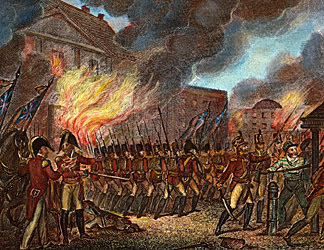 After debate, in which pro-British Federalists opposed any action, Congress passed an act declaring war on Great Britain on June 1, 1812. Politically, Madison's action angered the Federalists over what they viewed as Republican favoritism toward France. While there was initial enthusiasm for the War by those who saw the opportunity for territorial expansion by seizing British and Spanish territory in North America, it soon became apparent that the U.S. was ill-prepared for a military contest with Britain, which had built up both its land and naval forces to confront Napoleon in Europe. The British Navy imposed a punishing blockade of the ports on the Atlantic coast, and its Army successfully attacked Washington, forcing the President and First Lady Dolly Madison to flee the White House, taking with them a portrait of George Washington and other valued pieces, before it was burned along with the Capitol and other government buildings. Canadians also repulsed an American invasion of Lower Canada. But American forces were able to win some important victories. Three weeks after the burning of Washington, British warships began firing on Fort McHenry, which protected the entrance to Baltimore's harbor. The bombardment continued for twenty-five hours, but the Fort survived the assault. Francis Scott Key, who was aboard a ship several miles away, wrote a poem later put to music as the "Star Spangled Banner" celebrating his sighting of the American flag continuing to wave above the Fort. U.S. forces also were successful in actions on Lake Champlain and at Detroit. Perhaps the most significant American victory was the defense of New Orleans led by Major General Andrew Jackson, which actually took place after the signing on December 24, 1814, of the Treaty of Ghent ending hostilities but before news of the treaty had crossed the Atlantic. Jackson's victory at New Orleans was widely celebrated, and politically the effort spiked the popularity of Madison and his party, along with furthering the decline of the Federalists, who were criticized for what many viewed as lacking patriotism by their opposition to the War. As he approached the end of his second term, President Madison announced that he would not run again, continuing the precedent set by George Washington of serving only two terms. James Monroe, Madison's Secretary of State, was nominated by the Democratic-Republicans in the Congress over former Georgia Senator William Crawford, overcoming opposition largely based on his being another potential president from Virginia—with John Adams as the only non-Virginian of the first four presidents. In the general election, the Federalists, who had virtually collapsed as an entity due to their opposition to the War, did not nominate an official candidate, but Rufus King, a Federalist from New York, ran without the party's formal endorsement and was soundly defeated, gaining only 34 votes to Madison's 183 in the Electoral College. Following his election victory, Monroe commenced a 15-week tour through the New England states, the first presidential tour since George Washington's, and later toured the South and West, helping to build his popular support.